This functional bunk bed will be the perfect addition to your child's bedroom. 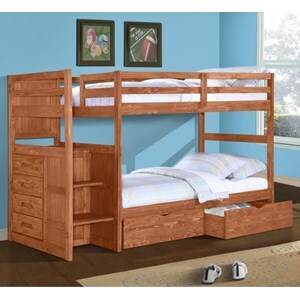 The sturdy bunk bed has a simple timeless style, with a warm medium Cinnamon wood finish. Built-in stairs make it easy to climb up and down, while spacious storage drawers allow you to make the most of your space, offering plentiful storage for clothing, bedding, and toys. Mattress ready, no bunkie board required. The 1012 Casual Twin Over Twin Bunk Bed with Stairs and Storage Drawers by Donco Trading Co is available in the area from BigFurnitureWebsite.